Cycling campaigners in Cork have called for “sustained enforcement” to tackle parking in bike lanes. They said the failure to enforce the law in relation to what is a “highly visible and dangerous” traffic violation effectively renders the substantial taxpayers’ investment in such cycling infrastructure useless. They also want protective barriers installed to make bike lanes safer, especially along key cycling corridors such as South Main St, Washington St, and Alfred St. They made the calls at the first cycling rally in Cork organised by the Cork Cycling Campaign last night. Dozens of cyclists gathered outside City Hall ahead of a City Council meeting to demonstrate the depth of feeling on the issues. Christopher O’Brien, 78, a racing cyclist from 1959 to 1973, said while it is getting easier to cycle around the city, parking in bike lanes is putting cyclists at risk. Libor Kampas, who is originally from the Czech Republic but who has lived in Cork for 13 years, cycled to the rally with his daughter, Karolina, 4, on a crossbar seat. “She’s been on the bike every day since she was 10 months old,” he said. “I do worry about her sometimes. You never know when you are going to get into trouble. But that’s life. He also called for the development of longer cycle ways, linking the city to coastal locations such as Kinsale or Garrettstown. A car obstructs a cycle lane on Liberty St. The Cork Cycling Campaign wants to see more fines handed out for parking like this. Campaign chairman Dean Venables said there are good examples of cycling infrastructure in the city, particularly along Pope’s Quay and the Western Rd which have encouraged the take-up of cycling. However, he said campaigners want to see protective barriers installed along cycle lanes where parking in cycle lanes is pervasive, and for the development of high-quality segregated cycle lanes wherever feasible. “Parking in cycle lanes is a dangerous, frequent, and highly visible traffic violation, yet attracts less than 1% of all traffic fines. This needs to change,” said Mr Venables. Everyone know that Cork has serious traffic congestion. Public transport is part of the solution, but the city needs a functioning cycle network as well — one that people of all ages and abilities can use with confidence. “Safe and usable cycle lanes would encourage many more people to cycle. “Higher rates of cycling would reduce traffic congestion, air pollution, and parking demand in Cork. One of the event’s key organisers, Conn Donovan, said the Cork Cycling Campaign is building. “We are a small group, but we are getting bigger every year,” he said. 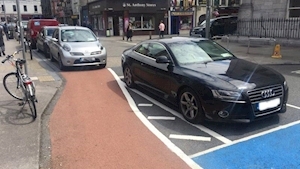 Solidarity councillor Fiona Ryan has tabled a motion, due to come before council in about two weeks, calling for the installation of protective barriers where parking in cycle lanes is a persistent problem. The development of cycling infrastructure is expected to be a key part of the National Transport Authority’s Cork Metropolitan Area Transport Study, which is due to be published for public consultation soon.